This tool allows you to apply moving, rotating, shearing, perspective and scaling corrections using handles placed on canvas. You can use 1 to 4 handles, and the effect depends on the number of handles. The tool acts on a selection, or, if there is no selection, on the whole layer. The active handle is bigger than the others. When the mouse pointer is on a handle, it goes with a small icon that represents the active action. With 1 handle: click and drag the handle to move all pixels of the selection. With 2 handles: when you click and drag a handle, you rotate around the other handle as a center, and you scale the selection, keeping the aspect ratio. With 3 handles: when you click and drag a handle, you shear and scale the selection, aspect ratio is not kept. With 4 handles: when you click and drag a handle, you change perspective and scale the selection, aspect ratio is not kept. or by clicking on the ShiftCtrlH keyboard shortcut. Press Shift and click on a handle to move it. Press Ctrl and click on a handle to remove it. 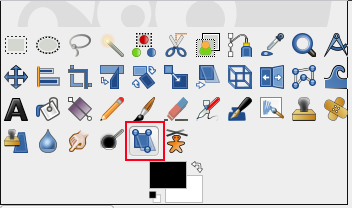 The available tool options can be accessed by double clicking the Handle Transform tool icon. in toolbox. See Sección 4.1, “Características comunes” for a description of tool options that apply to many or all transformation tools. These options are describes in key modifiers section.